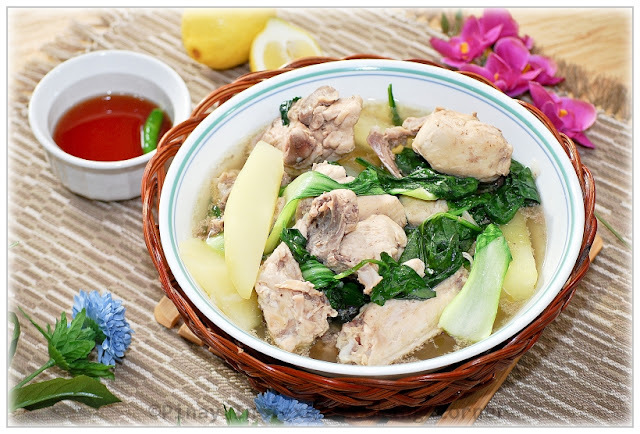 Tinolang Manok, being the famous version of tinola was even referenced in Chapter 3 of Jose Rizal's book, Noli Me Tangere where Capitan Tiago ordered the said dish after he missed eating it for a long time when he extended his stay in Europe. 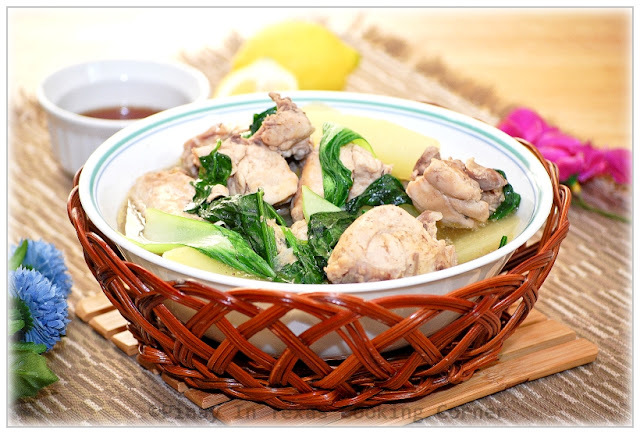 Manok in tinola is best complimented with green papaya wedges and chili pepper leaves. 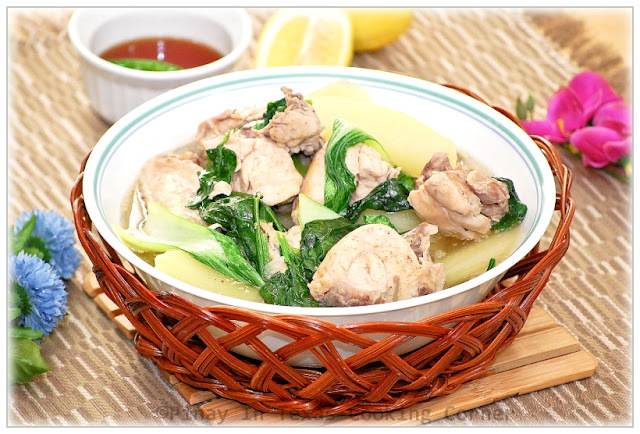 I remember how I love Chicken Tinola when I was young. My mom used to cook it a lot and most of the time, she used home-raised native chicken instead of broiler chicken. This type of chicken has a stronger taste and tougher meat and has to be cooked for a longer time. But I'm telling you, it is a lot flavorful compared to commercially raised chicken! Here in Texas where papaya and chili leaves aren't usually available, I've learned to use different substitutes for them. Sayote (pear squash) is the best substitute for papaya and during times when even sayote is unavailable, potatoes will do. For the chili leaves, greens like bok choy, spinach and napa cabbage will be good...but I must say that nothing compares to the flavor that chili pepper leaves add to tinola. 1. Sprinkle chicken with salt and pepper. Let sit in the refrigerator for at least 15 minutes. 2. 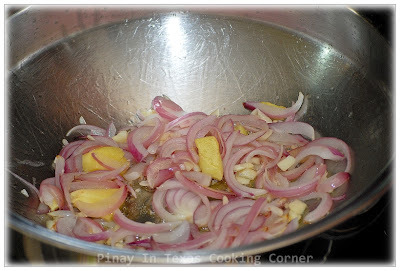 In a large saucepan over medium heat, saute garlic, onion and ginger in olive oil until garlic is light brown. 3. Add chicken and saute until juice starts to come out. 4. Add water and fish sauce. Bring to a boil. 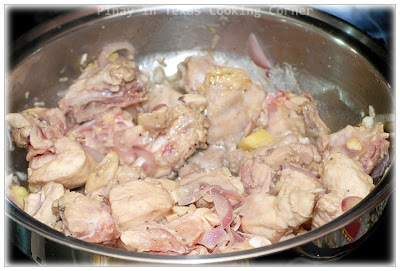 Reduce heat, cover and simmer until chicken is tender, about 15 minutes. 5. Add papaya and cook until tender, about 15 minutes. 6. Add salt and pepper to suit your taste. Add spinach and baby bok choy. Cover and let simmer for 2-3 minutes. Remove from heat. 7. Serve hot with steamed rice! Yum!!! I love Tinola! My friends cook it about once every 2 weeks or so and I'm always inviting myself over when they do :) We also have a similar dish in my culture called Caldo. Nothing is better than a classic chicken and broth soup...delish! Looks delicious! Reminds me of the tinola my mom used to make! I love that you used green papaya on this dish. Well, sometimes I use chayote if papaya is not available. 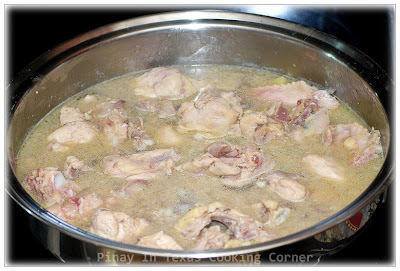 Your recipe is sooo original Pinoy, Tina which I really like. 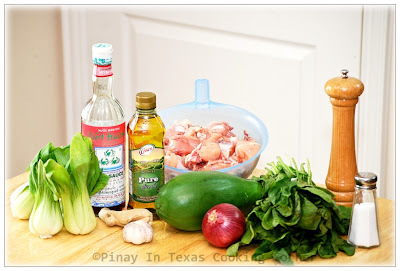 We used to make green papaya curries, stirfry and stew. this one looks awesome. My fav soup and I love soup too. Nice veges inside making it a complete meal. Mmm..I can imagine that this soup tastes and smells amazing! Beautiful, healthy and comforting at the same time. Great job Tina, your dish sound incredibly tasty! 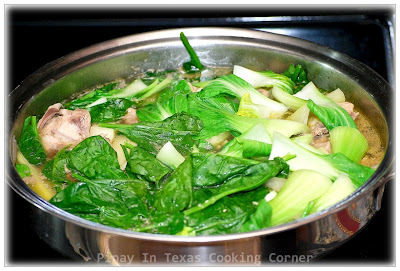 Love baby bok choy, I have a similar recipe and yours sounds delicious. Thanks for the share. wow, this looks incredible. Perfect for this "cooler" weather we are supposed to be getting here soon! Mmmm! A ginger based soup. That just sounds like heaven. And with the papaya too! I would love a bowl full of this! What a nice comfort dish. It's getting colder at night and this will make me happy for sure. Yummy! 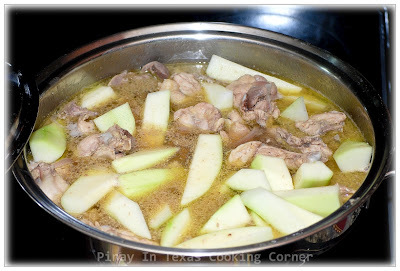 Copyright © 2011-2015 Pinay In Texas Cooking Corner. All rights reserved.